MINI COOPER WINS ‘FUN TO DRIVE CAR OF THE YEAR’ AWARD. It’s fast. It’s packed with power. And most of all, it’s unbelievably fun. Driving the MINI Cooper S truly puts exhilaration on full throttle. And if you didn’t take our word for it, gear up for a change of heart. 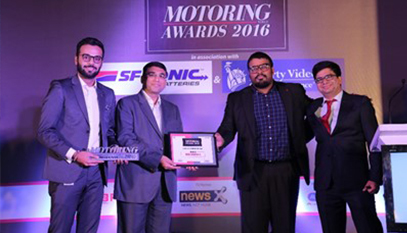 The MINI Cooper S has won the ‘Fun to Drive Car of the Year’ award at the Motoring Awards 2016 held in New Delhi. This spectacle started off on a high note with distinguished leaders and members from the automobile industry in attendance. The jury for the four wheeler awards comprised of Mr. Rohin Nagrani (Managing Editor, Motoring World), Mr. Charles Pennefather (Assistant Editor, Motoring World), Mr. Ashish Doshi (Classic Car Curator), Mr. Sameer Kumar (Automotive PR and Media Professional), Mr. Raunak Ajinkya (Writer, Motoring World). This victory further stamps the fact that the MINI Cooper S is peerless when it comes to pure, unadulterated driving thrills.